The Geographer Write-On Globe from Replogle is perfect for geography quizzes and games. 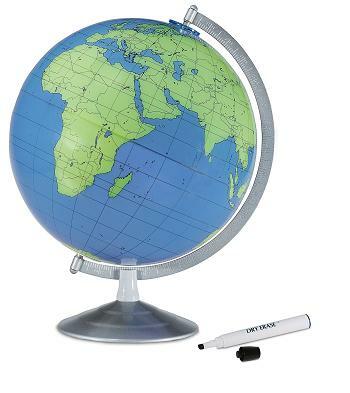 Students can write directly on the globe surface with the included dry erase marker. The blank political map offers plenty of space to write the names of oceans, countries and cities. Wipes clean after ease use. The Geographer is mounted on a brushed nickel metal base with a calibrated semi-meridian.